In a Circle, You are a Reflection of each other…..Discover Who You Are. 20 years ago I was invited to a circle gathering for a weekend. I showed up with no understanding of what a small group of people could create in a circle. I left humble, translucent & transformed. This doesn’t take a mystic or seasoned sage…..trust me, those arrive without invitation. There are many books around about ‘calling a circle’, and it only takes 2-3 friends to get it off and running. Sometimes less is more:) But creating an Emerging Soul Circle can become an exploration of your greater IAM presence and the newly discovered awareness of what that may entail. Are you ready to see YOU and all of your miraculous mystery? I created a small circle of 5 friends around The Emerging Soul Cards this year. My intention was to explore the cards, one or two at a time, as guided. My dear friend & resident mystic, Nancy, helped me create the framework that we would work within each time we met. It goes something like this. 1. Opening To Your Greater IAM Presence ~ Readings from selected IAM writings. Examples: IAM THAT by Sri Nisargadatta Maharaj, Blueprint of Oneness Saint Germain/McNamara. We also love Hafiz (The Sufi Mystic) and Eva Bell Werber’s writings…..she was such a christian mystical writer. And the Upanishads. 3. Explore ~ an Emerging Soul Card. This can be done in a variety of ways. We started line by line. We discussed what the line triggered in each of us. What did it mean? How is it relevant in my life today? Perhaps examples of life experiences that expanded the card’s message. We kept our own personal insights on each card. Short notes to remind us of our journey through the 56 cards. 4. 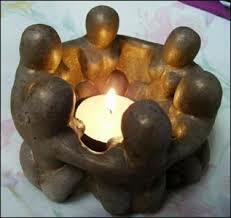 Gratitude ~ For the circle, our muses, our insights and our noble selves. Expressing gratitude leads to peace and joy. It removes all disappointments, judgements and fears. Find your way of expressing gratitude each time you gather as a closing to your circle. This is just a beginning, an outline of where you might want to start. Infuse your own spiritual traditions into the circle and build layers of ceremony to assist your exploration. Keeping the circle to an agreed upon time is most beneficial.